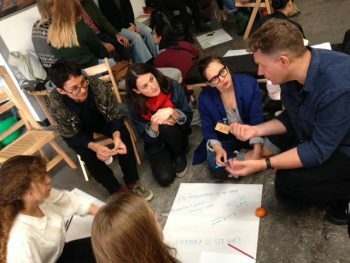 A collaborative DIY workshop to collect ideas on how to start an alternative art school in a handy, informative and entertaining guide made by its participants. Help us put together a guide on How To Start Your Own Art School! Come along to the workshop with your tips, ideas, stories, anecdotes, advice and full-blown manifestos. We will use all kinds of techniques, including collage, drawing, calligraphy and cut up poetry to produce A6 zine (105mm x 148mm). Materials and tools will be provided but you are welcome to bring your own. The workshop will be a space to chill out, make something beautiful and exchange ideas. If you can’t come along to the workshop you can send your readymade page beforehand to info (at) artandcritique (dot) uk. What is Alternative Art Education? ART&CRITIQUE workshop, First Alternative Education Open-Day 2017. Photo School of the Damned. In the last ten years alternative art education has burgeoned into a full-blown movement, fuelled by economic crisis, austerity and the liberalisation of higher education. But what is alternative art education? Who is it for and what is it alternative to? There are as many different formats and models of alternative art education as there are art schools, but in what ways is alternative art education expected to be different from traditional art education? Should alternative art schools try to emulate accredited MFAs or are they expected to radically re-imagine art education? How should alternative art schools be organised, structured and funded? Are alternative art schools expected to resist and reform institutional models of education and pedagogy? What would a cooperative art school look like? We will address some of these questions, exchange ideas and discuss the future of alternative art education in a participatory workshop. Come along and bring your own questions. 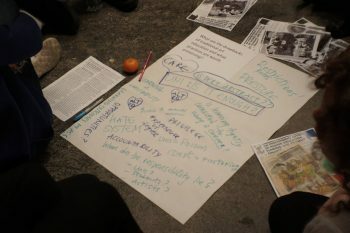 This workshop is part of the UK Commons Assembly organised in the context of The School for Civic Action in collaboration with Commons Rising, an open platform for commons initiatives to come together, exchange knowledge and to see if there is an appetite for an ongoing UK Commons Assembly. In a contemporary context of much inequality, the Commons discourse introduces models of sharing. The Commons are about the assets that belong to everyone, forming resources that should benefit all, rather than being enclosed to just a few. The aim of the day is to put on an exhibition showing the wealth of Commons projects happening in the UK. There will be discussions as well as workshops to inform the public about the commons. It is also an opportunity to vision how the commons might work beyond the individual projects and to set up practical outcomes going forwards. School of the Damned’s FIRST 100% OFFICIAL UNOFFICIAL ALTERNATIVE EDUCATION OPEN-DAY, 1 Oct 2017. Flyer by School of the Damned Class of 2018. 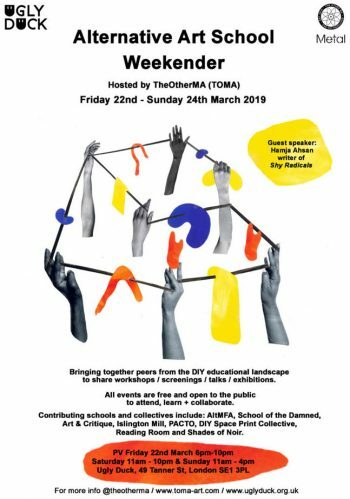 THE FIRST 100% OFFICIAL UNOFFICIAL ART EDUCATION OPEN-DAY is an informal open day exploring the plural experiences of alternative art schools and wider conversations of alternative education all together. An opportunity to get to know existing alternative art schools but also teach you how to DIY or DIT (Do It Together). School of The Damned will use this day as the launch for inviting applications for 2018/19. Alongside this, alternative art schools or courses will showcase how they are unique through workshops presenting their individual identity; AltMFA, [ART&CRITIQUE], PACTO, School of the Damned, Syllabus, TOMA, Turps Banana. For more details on each workshop please click the headings below or download the programme. A workshop introducing ‘The Active Archive’: an online investigative tool for those interested in engaging with and facilitating alternative ways of learning. DOWNLOAD our page from the zine with an A4 poster. 13:00 Art&Critique: What is alternative art education? Within the last ten years alternative art education has burgeoned into a full-blown movement, fuelled by economic crisis, austerity and the liberalisation of higher education. But what is alternative art education? Who is it for, and what is it an alternative to? There are as many different formats and models of alternative art education as there are art schools, but in what ways is alternative art education expected to be different from traditional art education? Should alternative art schools try to emulate accredited MFAs or are they expected to radically re-imagine art education? What are the drawbacks of traditional art education and what practices are worth preserving? 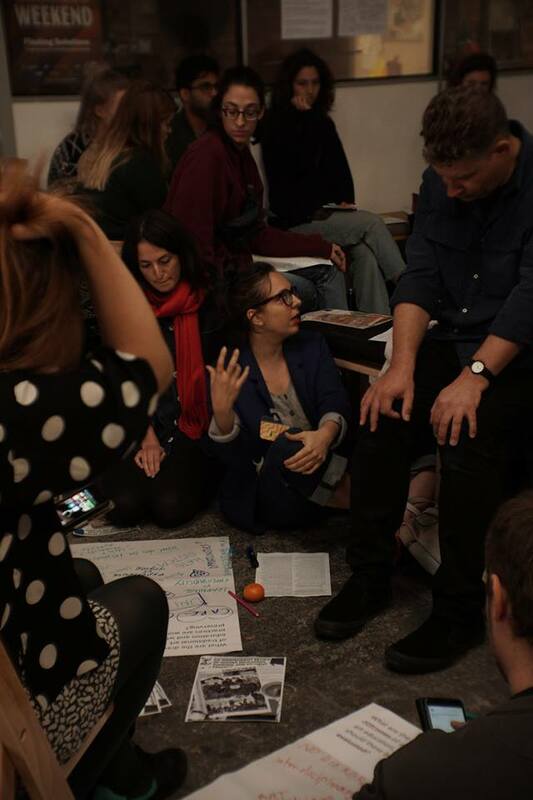 What alternative or radical pedagogies and practices would play an important part in alternative art education? What are the learning outcomes of alternative art education, and how should these be evaluated? How should alternative art schools be organised, structured and funded? Should they be free, accessible and self-organised? How do alternative art schools get access to resources and what do they need to become sustainable? Do alternative art schools have social and political obligations? Are alternative art schools expected to resist and reform institutional models of education and pedagogy? Should alternative art schools challenge art institutions and the art market? Should alternative art schools participate in political struggles of resistance against war, social injustice and climate change? What are the objectives of alternative art education? Together we will address some of these questions, exchange ideas and discuss the future of alternative art education in a participatory workshop. Come along and bring your own questions and ideas to the discussion. Download our zine page with an A4 poster in colour or black & white. AltMFA is a recipe that we make up together, inventing as we go, using whatever ingredients we can get hold of – a cocktail of the personalities, passions and histories of whoever is at the meeting. Bring an ingredient to add to the strange salad we will be making together as we collectively transcribe the recipe for an alternative art school. Pacto would like to further explore how self organisation takes place. A workshop challenging the symposium to create a model for collaborative research. Wysing Arts Centre’s Assistant Curator John Bloomfield will be joined by members Tom Smith and Frederica Agbah from Syllabus II and III to discuss the manifestos that each year’s group have drawn up. Composed during the first retreat of each year the manifestos are used to shape the ideals of the group and to lay down ground rules for the year ahead. Patricia Mulligan (Turps Banana) will be in conversation with Emily Woolley (SOTD) about her experience of the correspondance course and finding ways to practice and study post graduation. TOMA invite you to form a team and take part to test your knowledge and forge discussions about alternative ways to educate yourself outside of the institutional system in 2017. This three-hour workshop is designed to help you to get the most out of your group critique by taking ownership of your feedback. During the workshop you will consider the most important aspects of giving and receiving feedback/criticism and you will have the opportunity to design and test your own crit model for future use. 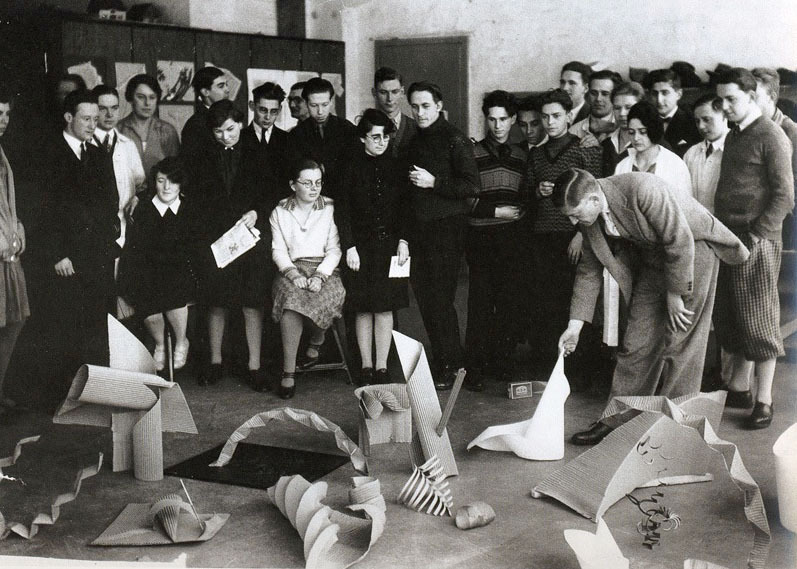 Josef Albers Preliminary class group critique. Bauhaus Dessau, 1928-29. Photo by Otto Umbehr. The aim of the workshop is to get us to think critically about how we give and receive feedback as well as creating a culture where it’s okay to try things out. What is a crit for? How do you feel when you receive feedback? We will start by sharing our experiences of giving and receiving feedback in the past. How comfortable have you felt sharing your thoughts with your peer group? How have your peers reacted to your comments? What do you think the role of the peer is in the crit? With these ideas in mind, we will devise our own crit models and test them in groups of 4-5 people. Please bring along a work in progress to participate in these micro-crits. We will wrap up by sharing our feedback and proposals for how we would like to conduct our crits in the future. Sophie Barr is an artist and Lecturer in Cultural and Contextual Studies with a growing interest in alternative modes of art education. She is currently studying for a Doctorate in Fine Art at the University of East London and makes art in Wood Green, north London. You can find out more about Sophie and see some of her latest projects in her blog Intellectual Simulation.